I once had a friend tell me I was a marketer’s dream because I easily get sucked into wanting new things after watching commercials. So it’s really no surprise that I was excited about Lay’s “Do Us a Flavor™” promotion where they are asking American to vote on a new flavor of chip. The three new flavors are Chicken & Waffles, Sriracha and Cheesy Garlic Bread. The three new flavors that Lay’s has been offering. A week ago I found the Cheesy Garlic Bread in a local Target and bought two bags, one for home (for Tammy and me) and one for work (for my coworkers). The Cheesy Garlic Bread chips got good reviews from everyone who tasted them. They smelled and tasted cheesy and garlicky. I left a bag out on my desk and had several coworkers stop by multiple times throughout the day. While I liked the flavor, there wasn’t anything that made me think it was great. I thought it was just another cheesy flavored chip. I’ve spent the last 10 days looking for the remaining flavors. This past Saturday Tammy and I went to 4 or 5 different Kroger’s (not including the two I had already been to), three different Target’s, two Wal-Mart’s and two Walgreen’s searching for bags of Chicken & Waffles or Sriracha. All I found was the Cheesy Garlic Bread flavor in one store. I even asked someone who was stocking the Lay’s at a Wal-Mart if they had any of the new flavors, but they didn’t. I got to work today and one of my coworkers had brought in a bag of the Chicken & Waffles because she knew I had been looking for them (she found them at a Wal-Mart in Southaven, Mississippi). I excitedly tore into the bag and smelled. I didn’t think it smelled like chicken & waffles, which I had just eaten, so I made my coworkers take a whiff to see what they thought. No one thought it smelled like chicken & waffles. Since the taste of chicken & waffles was fresh to me, I popped the first chip in expecting to taste what I did at Cafe Eclectic. Much to my disappointment it wasn’t the same. In fact I wasn’t really sure what I was tasting. It tasted like a mild version of the Sour Cream and Onion chips that finished with a taste of maple syrup. Even my coworkers didn’t think it tasted like chicken, but agreed that they could taste the syrup at the end. I snacked on the chips throughout the day, never really tasting the chicken, or the syrup, again. I told my coworkers I was bringing the bag home for Tammy to taste and was surprised at their reactions when I said I would bring them back tomorrow. They didn’t care. When I showed Tammy the bag she got excited and reached into the bag immediately. She said the chicken flavor wasn’t as strong as she would have liked it to be, it was OK. What I found interesting was that she said she could really taste the syrup flavor. So I guess technically we are a house divided, but then again I haven’t been able to find the Sriracha flavor. 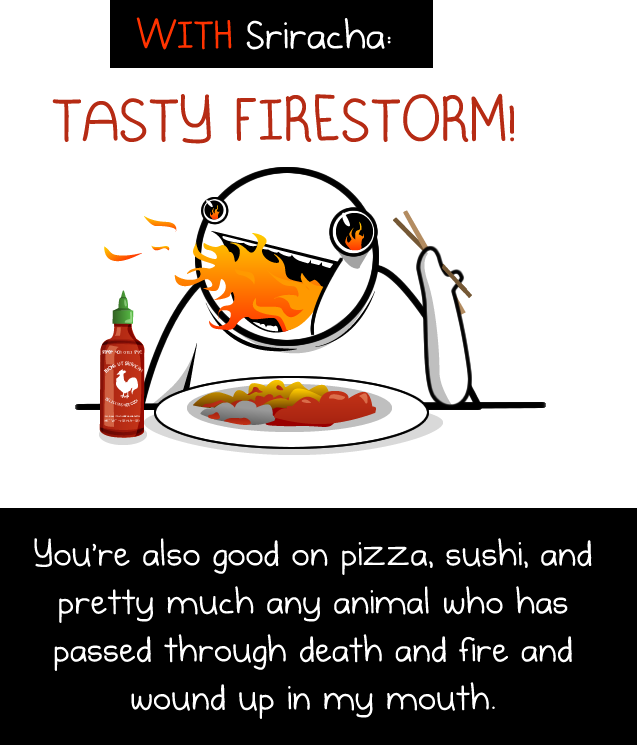 I told Tammy that I think the Sriracha will win because I think it’s the one flavor that can be most easily replicated, and because The Oatmeal has an entire portion of their site devoted to it. I’m still on the lookout of the Sriracha flavor and have even called my Mom, who owns a grocery store, to see if they have any (they didn’t). So, if anyone out there at Lay’s is listening, I’m offering myself to be a marketer’s dream, your taste guinea pig. Feel free to contact me through here, Facebook or Twitter if you can help. Gallery | This entry was posted in Daily Life, Food and tagged daily life, food, humor, Postaweek2013, shopping, social media, Sriracha, Tammy, Walgreen. Bookmark the permalink. I saw this promotion too and really wanted to try the cheesy bread ones. Glad to know I’m not missing out a whole lot. I don’t like sriracha, and I’m annoyed that chicken and waffles is so mainstream now, so I guess in the end I’ll stick with normal wavy Lays. Chicken and waffles flavor may taste fine, even good, but a chip can’t replicate the chicken and waffle experience (yet, anyway–maybe we all have Google brain implants). Of course, a chip doesn’t really replicate the sensory experience of real chips and sour cream, but has its own delightful taste nevertheless. So I’ll just shut up now. EDIT: …maybe WHEN we all have Google brain implants. Which obviously I need sooner rather than later. Yeah, Jake loves that sriracha stuff. It’s spicy enough that I have to use it sparingly. But I think more people like it than the other two flavors.